Each year, Civic Ballet performs at the Tupelo Art Showcase in the fall and presents a production in the spring. They also perform at various other events. Check here for our next performance. 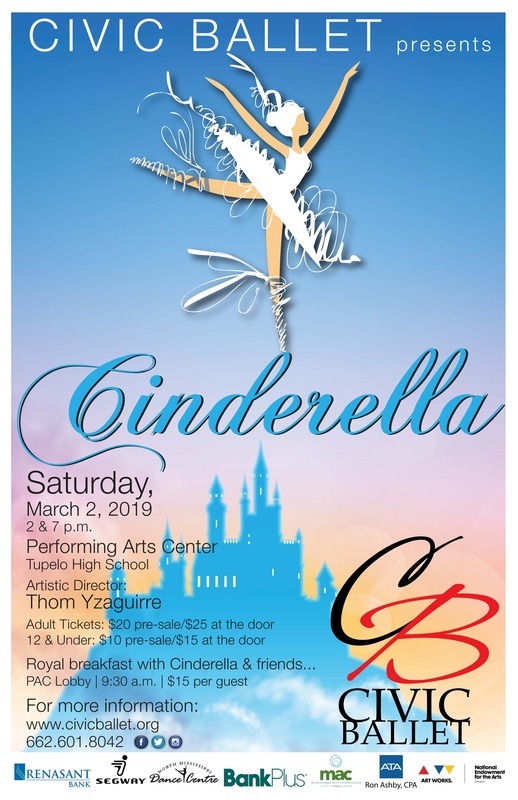 Civic Ballet will present Cinderella, under the direction of Thom Yzaguirre, on March 2, 2019 at 2pm and 7pm at the Performing Arts Center on the campus of Tupelo High School in Tupelo, MS. Pre-sale tickets are $20 or $10 for 12 and under. Prices at the door the day of the event will be $25 or $15 for 12 and under. There is also a Royal Breakfast with Cinderella & friends at 9:30am on March 2nd. It will take place at the same location and tickets are $15 per guest. Come meet the dancers, dance on stage, and get treated like a princess. 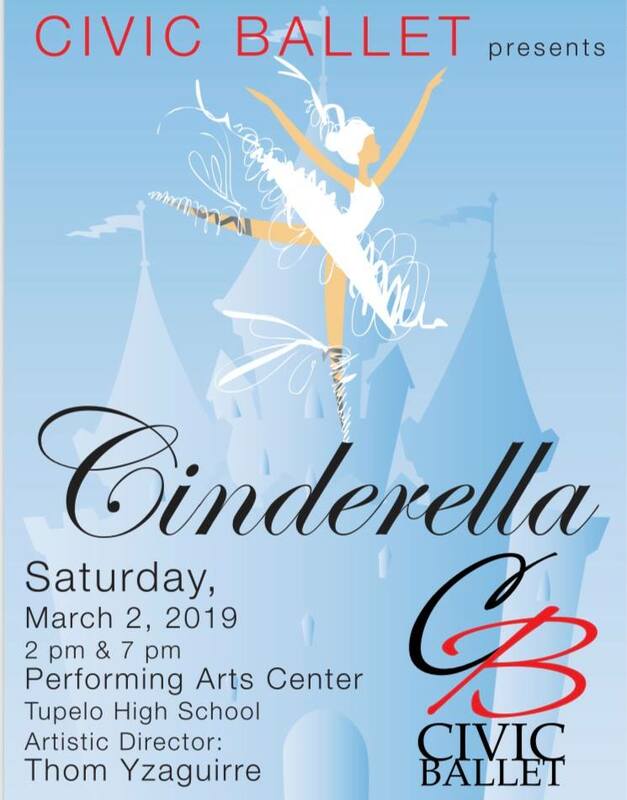 Civic Ballet will present Cinderella on March 2, 2019 at 2pm and 7pm at the Performing Arts Center on the campus of Tupelo High School in Tupelo, MS. Check back here or on Facebook for updates! Civic Ballet will have a float in the 70th Annual Reed's Tupelo Christmas Parade on November 30, 2018. 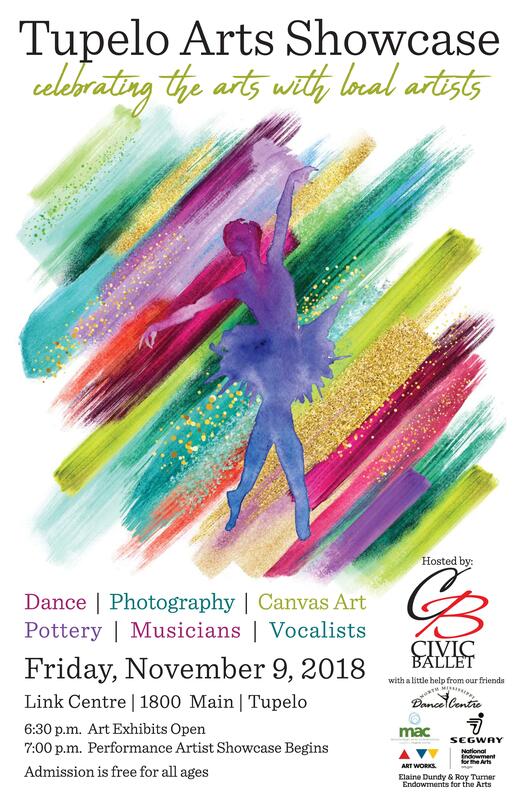 Civic Ballet will perform at the 8th annual Tupelo Arts Showcase on Friday, November 9, 2018 at the Link Centre in Tupelo, MS.
Civic Ballet will perform at Celebration Village on October 25 at 4pm. Celebration Village is a fundraising event for Sanctuary Hospice House. Click Here for more information about the event. Civic Ballet will present its first Dance Camp this year from July 30 - August 3, 2018. Camp is led by Civic Ballet dancers. The camp is open to beginner and intermediate level dancers and the cost is $100. 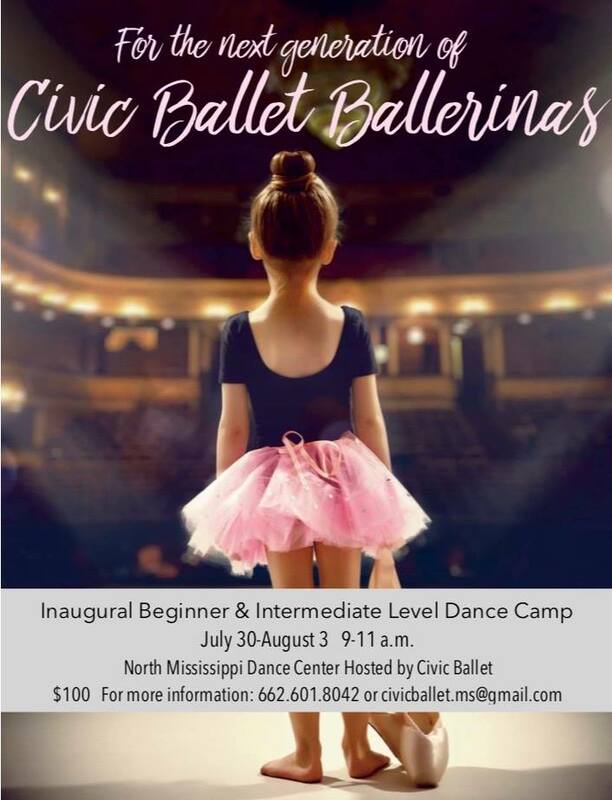 For more information, call 662.601.8042 or email civicballet.ms@gmail.com.